technology is pretty darned spiffing, doing everything you want it to do, everything you didn't know you wanted it to do, and a whole slew of things that you didn't want it to do, but it's going to do anyway. that's what it gets paid for. but a bit like electronic drum kits, there are things better done by what may more appropriately called analogue technology. percussively speaking, acoustic drum sets make some utterly fabulous noises, but they don't make the same noise on each part of the drumhead. bizarrely, there are armies of technologists at roland and yamaha trying manfully to imbue their round plastic boxes with zones that accurately imitate the real thing. if you've ever played a drumset, even in fun, you may well be aware that as one drum resonates, so do all the others. buzzy snares are the best example of this. electronica doesn't understand the concept of sympathetic vibration, so it has to be built in. does it really make sense to spend thousands of pounds on transistors and printed circuits that pretend to be other than they actually are? of course it doesn't. but aside from tying my flag to the luddite party, things are less cut and dried than i have made them appear. for were this article to end here, despite the fact that we'd all have wasted several minutes of our day, i figure i'd have been pretty successful in destroying any reputation that electronic drumsets might have acquired. which leads me not at all smoothly to skin. in case you haven't paid much attention lately, skin is brilliant stuff, especially when it comes to keeping us dry (if that doesn't sound a mite too convoluted). 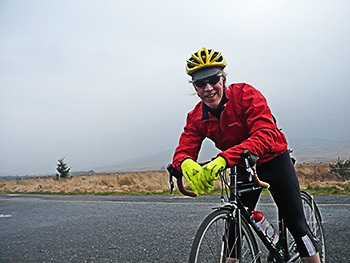 it may not be entirely the preserve of the touring cyclist, but the phrase 'it can't go deeper than your skin' has a great deal of truth in it. skin breathes very well, even if it does perspire every now and again. stand naked in the back garden (check for neighbours first) in the pouring rain and i can pretty much guarantee that your internal organs will be as bone dry (pardon the pun) as they were when you stepped out the back door. but, as the more observant amongst you will have noticed, it's the naked bit that will get you into trouble. fine upstanding and friendly though our local police force may be, i fear they may draw the line at exhibitionism on a bicycle. therefore it is necessary to resort to outside assistance in order to cycle cheerfully, drily and without the force being with us. in order to compete with skin, any waterproof needs to have a more visible presence (i know, i know), the not inconsiderable requirement to fend off quantities of precipitation and the comforting desirability to breathe easily, preventing the hapless rider from dissolving into a perspiring mess. i need hardly point out that the above requirements need vary according to climatic conditions, but then you knew that already anyway, didn't you? though comfortably into spring, there are parts of the united kingdom and the great world beyond which, on occasion, forget that this is the case, then remember later that same day. or vice versa. saturday past could be called to account as an excellent example of just what i wish to impose upon your day. mildly overcast at point of departure, i deemed waterproofs unnecessary, because i am nothing if not brazen in the face of having no idea what i'm doing. true to form, heavy cloud turned more and more steadily to rain. 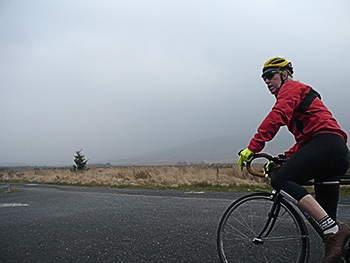 those who have ridden the aptly named ride of the falling rain will be aware of the road system on islay which allows going backwards in order to go forward; a mere snip to nip home and waterproof my skin. bright red would seem to check the visibility box, though i continually find myself mystified at the need to furnish contrasting panels sporadically about so many contemporary garments. craft's active rain jacket does so in triangular fashion across the top half of the back and swishingly so just below the exhaust flaps, one each side. these contribute nothing to the overall look and have, so far as i can ascertain, no particular practical or technological value. if mr craft is reading this, can i ask that you put a stop to this practice forthwith? waterproof is as waterproof does; in order that i might identify any areas of seepage - though taped seams would promise not - i wore a light coloured jersey below. perhaps a touch predictably, that very jersey was devoid of rain imposed dampness despite a touch more rain than i had actually bargained for. it would be very untruthful of me to profess that jersey was also free from perspiration. though i am not one given to unbridled sweating, nor was i overdressed, the jacket's breathability failed to keep pace with forward motion induced heat. in mitigation, i have yet to come across a rain jacket that will leave one's person completely bone dry. 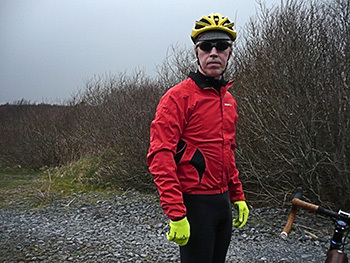 with regard to the craft active rain jacket, its breathability was on the right side of adequate. the collar is of a practical height, with a zip garage protecting the aforementioned skin and a very soft fleece lining. 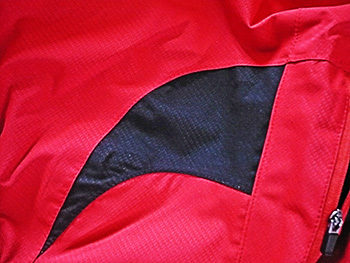 the hem is elasticated and backed with grippy stuff to keep it right where it needs to be. this stuff was darned effective in use. just above the hem at the back is a large, zipped pocket into which an entire wheel could probably be safely stowed. a covering flap will keep that wheel dry. the inside features a black, craft emblazoned mesh which extends to the inner recesses of both sleeves, the latter ending in elasticated cuffs. it's not a heavy jacket, though i figure not one for crushing into a tiny ball and placing in a rear pocket should the rain go off unexpectedly. but it's not really meant to. however, one of the very best bits about this jacket is where it came from; in this case, prendas ciclismo. i wear medium in pretty much every cycling top i possess, and consequently asked for tht size to be sent my way. andy, however, astute clothier that he is, contradicted by indicating that a small might be a better fit. he was absolutely correct. many an online retailer would cheerfully despatch whatever was asked for; service with a smile. even better than better, the price of the jacket has dropped from £89.95 to an unmissable £49.95, at which point, any debate over yes or no completely evaporates. buy one now before regret bites back. 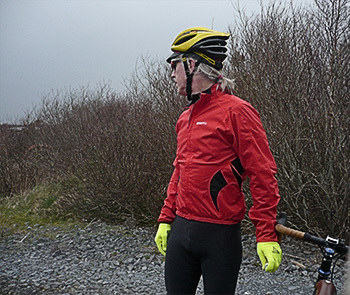 the craft active rain jacket is available in red, yellow or black, in sizes xs to xxl, but please heed the advice to move down one size from normal. posted wednesday 11 april 2012.